Because of its luster and texture, embroidery offers you an image with the highest visual impact. Your embroidered name and/or logo gives an elegant appearance as a left-chest image, an appliquéd full-back image for a jacket, or an initialed sports cap. Our clientele includes small businesses, car clubs, equestrian associations, sports teams, schools, community groups and many others, and one-to-one custom service is provided with no minimum order! Our catalogs offer a huge variety of brands and styles to match your activities and interests. 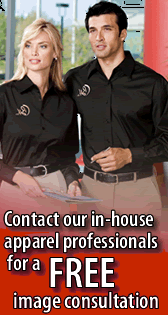 If you require assistance with garment selection our staff will be glad to help. The better the quality of the artwork we receive the better the results will be. Vector artwork is preferred in .cdr or .eps format, however, .jpg with at least 300dpi resolution at 100% size of application is accepted. Artwork modification is available. Digitalization is the process of converting your artwork into an electronic format. There is a one time setup fee per image. Once the artwork is digitalized we will keep it on file for future use without additional setup charges. Stitched out samples are provided to your ensure that you are satisfied with the quality and appearance of your items prior to application. Call us for price estimates. We offer discounts on quantities ordered.